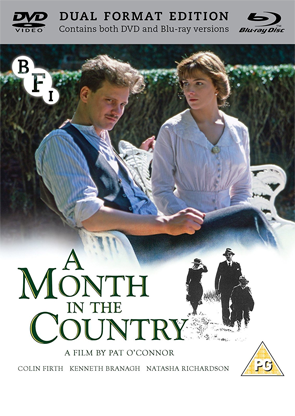 Adapted from the novel of the same name by J L Carr, A Month in the Country is set in the summer of 1920s rural Yorkshire following destitute World War I veteran, Tom Birkin (Colin Firth). Birkin has been employed by a village church to carry out restoration work on a medieval mural while coming to terms with the after-effects of the war. During his time in the slow-paced village, Birkin forms a close friendship with archaeologist James Moon (Kenneth Branagh), a fellow veteran who is also emotionally scarred following the conflict. The film follows Birkin as he settles into village life, forming romantic relationships and bonding with families and locals. Neglected after its initial 1987 cinema release, the film features a score by Howard Blake (The Snowman, The Avengers) and is notable for its strong British cast which also includes Natasha Richardson, Patrick Malahide and Jim Carter.